Professional Wrestler Eddie Guerrero arrives at Sydney International Airport. 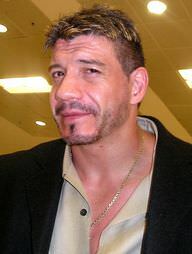 Eddie Guerrero was a Mexican-American wrestler. He wrestled in the Extreme Championship Wrestling, the World Championship Wrestling and the World Wrestling Entertainment. He is widely regarded as one of the greatest wrestlers of all time. He won 23 titles in his career, including 4 WWE Tag Team Championships and a WWE Championship. El Caliente, Black Tiger, Máscara Mágica, Latino Heat. He was married to Vickie Guerrero and he had 3 children. He suffered from alcoholism and an addiction to painkillers and other substances. He died of acute heart failure at the age of 38. His catchphrase was "I Lie! I Cheat! I Steal!". Eddie Guerrero gives a Frog Splash during his tag team match with Rey Mysterio against the Basham Brothers during a WWE house show held in Kitchener, Ontario, Canada on January 15, 2005. Eddie Guerrero at a SmackDown! taping in Tacoma, WA on February 10, 2004. A depiction of Eddie's character in the 1998 video game. Eddie Guerrero was a famous Mexican-American wrestler, who was born on October 9, 1967. As a person born on this date, Eddie Guerrero is listed in our database as the 4th most popular celebrity for the day (October 9) and the 34th most popular for the year (1967). People born on October 9 fall under the Zodiac sign of Libra, the Scales. Eddie Guerrero is the 140th most popular Libra. Aside from information specific to Eddie Guerrero's birthday, Eddie Guerrero is the 3rd most famous Mexican-American and ranks 20th in famous people born in El Paso, Texas, U.S. In general, Eddie Guerrero ranks as the 1752nd most popular famous person, and the 42nd most popular wrestler of all time. “The Famous Birthdays” catalogs over 25,000 famous people, everyone from actors to singers to scientists to serial killers and more. If you're curious to see who was born on your birthday, you can use our database to find out who, what, where, when and why. You can search by birthday, birthplace, claim to fame or any other information by typing in the search box, or simply browse our site by selecting the month, the day, the horoscope, or any other clickable option. 20th born in El Paso, Texas, U.S.